[This story of the Blagen Mill was, in part, excerpted and gently edited from writings by historian David Davis, Calaveras Ranger District, Stanislaus National Forest. ] Since we originally put it on the web site, we’ve been able to add details. 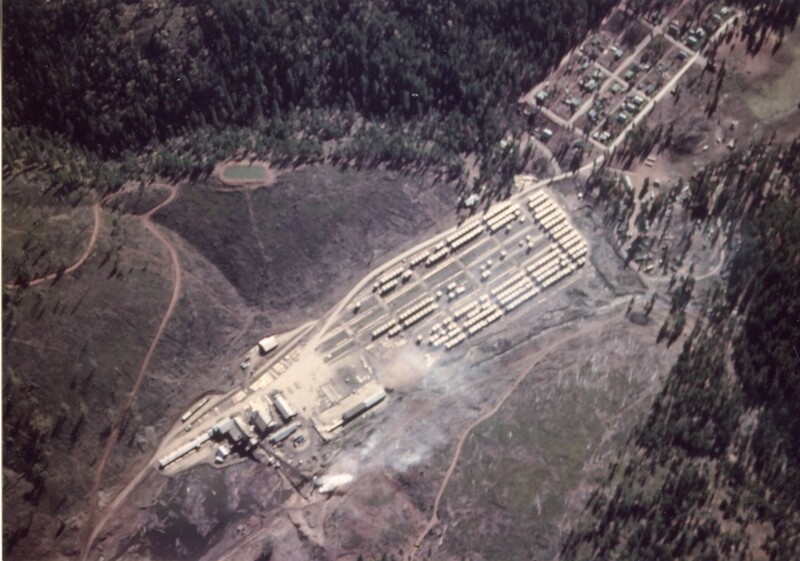 The Blagen Mill (1938-1962) was the largest mill to operate in the immediate vicinity of White Pines, California. Altogether, including employees at the drying yards at Toyon, the Blagen operation employed about 200 people, counting those working in the woods for the Blagen logger, “Doc” Linebaugh. The mill’s builder, Frank Blagen Sr., and perhaps even more, his son Howard and his family, captured the allegiance of people throughout Calaveras County, so that even when the mill became the property of outside investors it remained the Blagen Mill in peoples’ minds and hearts, and continues to be so today. Also, the fact that the community of White Pines continued to be populated with families who came south with the Blagens means that it will always be the Blagen Mill to the families of White Pines. The Blagen Mill was the third, and last, mill to operate in the immediate area of White Pines. Willis Dunbar owned what has been described as a portable mill there, at Dunbar Meadows, in the 1860s. Very little is known about Willis Dunbar’s mill besides the fact that it was small and was purchased from a previous owner in the area. The second mill, which operated about a mile from the Blagen Mill site, was the Manuel Mill (1927-1953). This older and smaller mill was powered by steam, while the Blagen Mill used electrically powered saws, although steam still did most of the heavy work such as moving the logs back and forth through the saws. According to Frank Blagen, Jr., electric power was first brought to the White Pines area in 1939 at the instigation of the Blagen Mill. Pacific Gas and Electric cooperated with the Blagen Lumber’s needs to the benefit of both companies. The Blagen family came to California from a logging community in Washington State, and before that from Denmark. Frank Blagen Sr., the initial owner of the Blagen Mill at White Pines, was a second generation Dane whose enterprising father owned and ran a large and successful Blagen family sawmill in Grays Harbor, Washington. This mill was considered very progressive in 1916, having converted from steam to electricity. 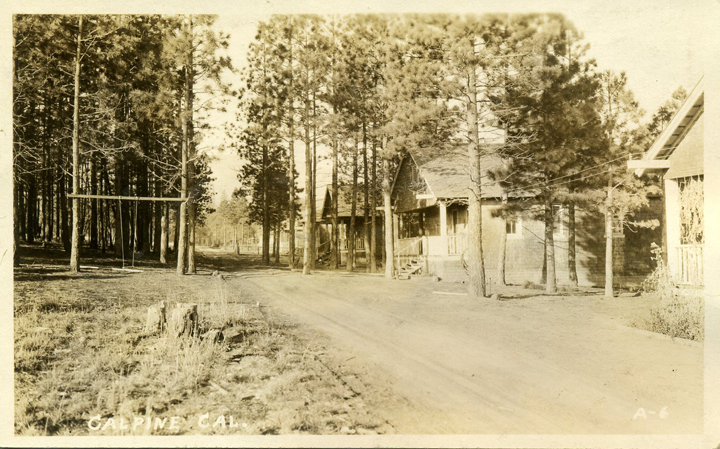 For economic and personal reasons, Frank Blagen Sr. left the security of the family mill in Washington and committed himself to an investment in an operating sawmill at Calpine, 20 miles north of Truckee, CA. In addition to acquiring the Davies-Johnson Lumber Company, he also acquired the town that the lumber company owned. 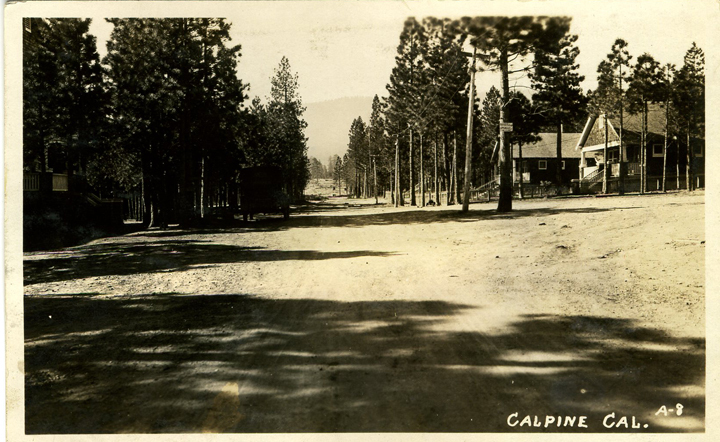 Calpine varied in population from 300 to 400 persons. 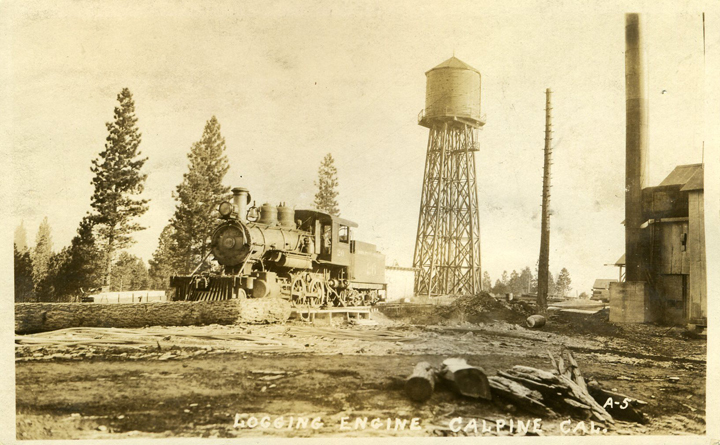 The Calpine mill used a Corless steam engine and a line-belt system to get power where it was needed; to the saws, the carriage, etc. According to some accounts, this arrangement was underpowered and caused continual problems. The Blagen Residence in Calpine? This photo was among others that had been the property of the Blagens. When I gave the photo this title, it made perfect sense to me, but ……… As you can see in the comments John Taubeneck said that it was incorrectly labeled. The label should have read about like this. This is the 300 ton Willamette skidder “Titanic” built for and used at Weed. In 1921, shortly after Long-Bell bought the Weed Lumber Company, they had this machine built. It was transfered to Ryderwood, Washington in 1927 and scrapped there in 1952. Thanks, John. I don’t know how you knew this from the little bit of the skidder that is shown in the photo, but when I went looking further, it was obvious you were right. A probable cause for finding it in the Blagen collection is that the logging family saw it in operation and took a photo. Those who don’t like digressions in the web sites they use are probably screaming, “Take the picture off the site.” Sorry, I like the story I made up about how it got here. All the above photos can be enlarged by clicking on them! By the late 1930s the Blagen’s mill at Calpine ran out of timber. As Frank Blagen’s son Howard puts it, “We had to move to a new stand or quit.” A deal was struck with the Calaveras Land and Timber Company (based in Grand Rapids, Michigan) for a stand of timber and a mill site in what soon became the White Pines area. Frank Blagen’s wife named the new town White Pines because the name seemed attractive, and not because any white pines grew there, which they don’t. 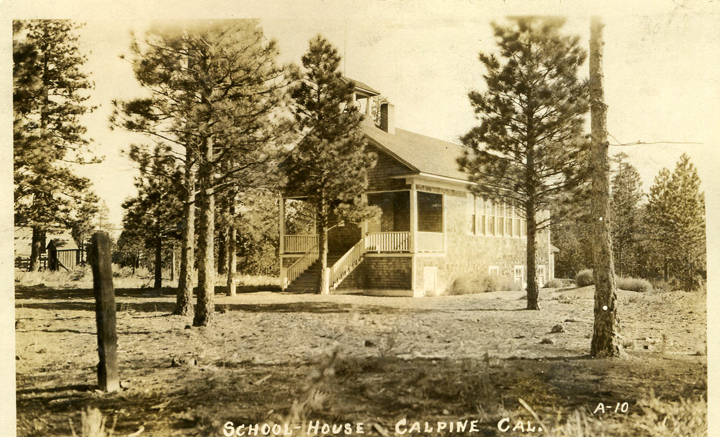 Whether or not they played a personal part in the move from Calpine, all interviewed sources seem particularly impressed with the fact that the entire town moved with the mill to the new location. 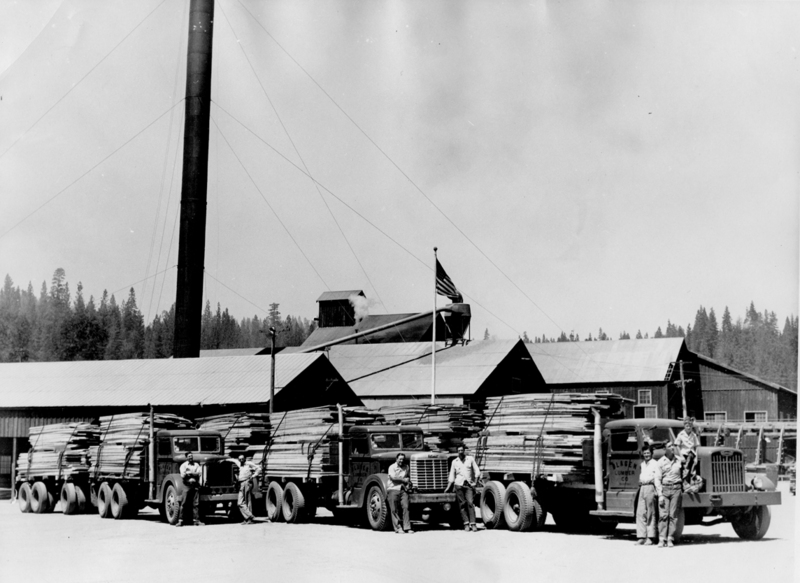 Much of the mill machinery was transported on four logging trucks over a period of several weeks, each round trip lasting between three and four days, starting in December of 1938. Because the old mill relied on steam and the new one on electricity, not all machinery could be used or adapted, but certain steam-powered machinery had been so efficient that Frank Blagen Sr. kept or adapted it. The Corliss was not transported because the new mill was to run primarily on electricity. 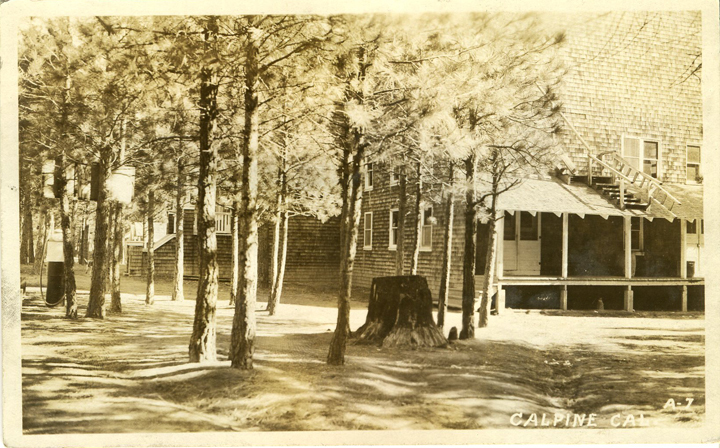 However, the boilers from Calpine were used at White Pines. Two used steam turbines were purchased in the San Francisco Bay area and a steam-run log carriage was installed to push logs into the electrically-powered saw. This carriage was called “the shot gun” and could be heard slamming into position even at a great distance. The drying kilns were also heated by steam. This arrangement failed to produce enough electricity to run the mill efficiently because calculations had been done on data accumulated at Calpine, on the eastern slope of the Sierras where the timber was considerably drier so the byproducts from the mill produced more heat than the same amount of fuel would produce on the western slope. Shortly after the Blagen Mill was acquired by American Box Company (ABC), P.G.&E. brought power to the mill and to the town, relieving the steam system from having to drive the turbine generators. No lake existed in 1938 when construction of the mill was begun. (The White Pines Dam and Lake were built in 1969 -1970). The millpond was dug in 1939 in a marshy area along San Antonio Creek where there had been no pond at all. Drinking water was provided to White Pines from Big Trees Creek, which flows out of Calaveras Big Trees Park. It ran by gravity to a reservoir that had been dug on a hill east of the mill. Today, Big Trees Creek is a seasonal stream that flows into White Pines Lake. Mill water was piped directly from San Antonio Creek into the mill’s boilers, rather than pumping it from the logging pond, and a large ditch was built off the west side of the creek to serve as an overflow channel. This photo which will enlarge many times by clicking on it, shows the mill in the lower left, the well laid-out town of White Pines in the upper right, Big Trees Reservoir above the drying yard, and the mill pond adjacent to the mill. We have a lot of great photos of Blagen Mill, but no others that show this great an overall view. Don’s wife was Faye Loomis, whose family came to White Pines with the Blagens in 1938. The Blagen Mill was a three-story mill that compares in size and appearance to other large Sierra mills (e.g., the West Side or the Standard) observed in historic photographs. Viewed from the air, in a “plan” or map view, the mill structures appear to form a gigantic “L” shape, although the foot of the “L” is longer than the “top” segment, which projected into the pond. The longer segment comprised the greenchain, where cut lumber was graded and sorted as it moved along a steel conveyor belt. This long, roofed segment is said by some to have been close to a quarter of a mile in length. The third story was much smaller than the lower stories and had only one purpose: to facilitate the changing and sharpening of the enormous bandsaw type of blade that sawed the full length of huge logs. Once a log was conveyed up the bullchain from the millpond, its initial processing began with this blade. A log might be halved or quartered or cut up in some other manner depending on the decision of the sawyer. Wood type, knots, timber quality, and other factors influenced the sawyer’s decision. 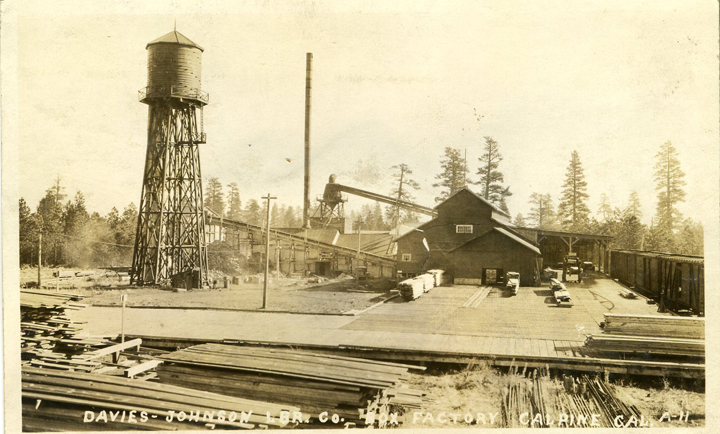 The Blagen Mill, even though Mr. Blagen had come here for the Sugar Pine, made lumber from many kinds of timber. There was a certain amount of Douglas and white fir, a larger amount of sugar and ponderosa pine, portions of incense cedar, and a few other types of timber as well. Unlike other mills that used old-fashioned circular blades having three- to six-foot diameters, a bandsaw blade could handle large sugar pines and other logs of impressive dimensions. The blade encircled two nine-foot diameter wheels placed approximately 18 feet apart and was called by millers “a nine-foot band system.” Still, there were logs even this system could not handle. 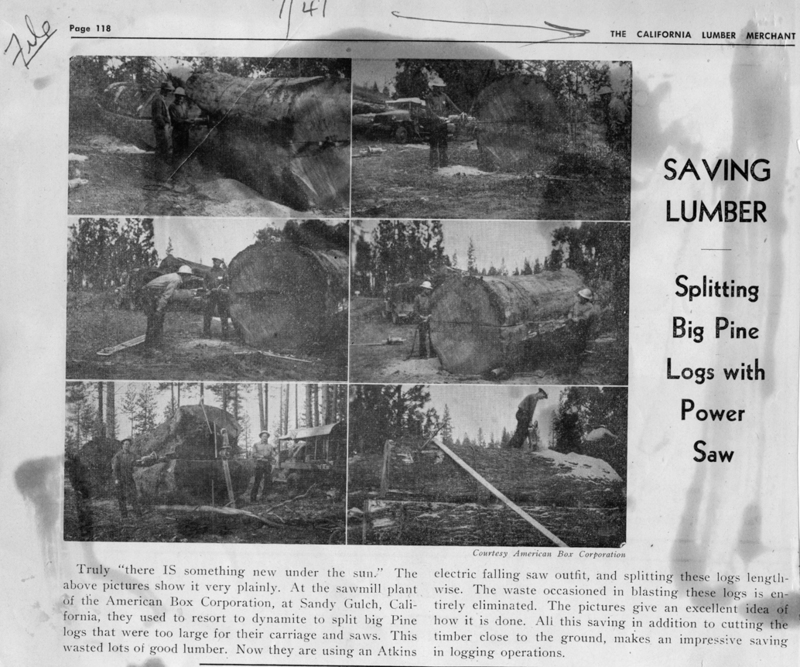 When a sugar pine’s diameter was more than nine feet, a log had to have holes bored in it (along the grain on one side) to blast it in half or in thirds with explosives. This was widely practiced by loggers and millers throughout the Sierra Nevada, until finally electric chain saws were invented that had long enough blades to rip the length of logs even 10 to 12 feet in diameter. In the 1940s the Blagen Mill purchased such a two-man chain saw, allowing oversized logs to be cut lengthwise before traveling into the mill. The slicing of such giants was performed beside the “brow log” at the edge of the millpond. The brow log itself was a steel beam a yard high and over 30 feet in length. It served as a solid and indestructible lip at the edge of the millpond, and was set in concrete. Log trucks pulled alongside the brow log to unload. Loads of timber often hit it with such force (on their way into the millpond) that an ordinary wooden brow log could not stand up to the daily beating. A major improvement in the new mill at White Pines was the resaw. The resaw was a secondary set of saws, also run by electricity, which were larger and horizontal, rather than vertical as in the Calpine Mill. Unlike the Calpine resaw, the new version could cut as many as three boards at a time. The efficiency of this improved system elevated production levels, so that more than 100,000 board feet of lumber could be produced per shift. According to figures given to reporters for the Stockton Record, the mill was producing between 15,000 and 20,000 board feet per hour in 1939. There were two seven-hour work shifts. After the cut lumber left the greenchain, where it was sorted according to size and type, motorized carriers moved a select portion of it to drying kilns. There were four of these, built in the form of long, flat-roofed buildings at least 40 feet wide. Flat roofs facilitated the drying process and were in no danger of collapsing under heavy snow because the snow melted as it landed on the warm rooftops. 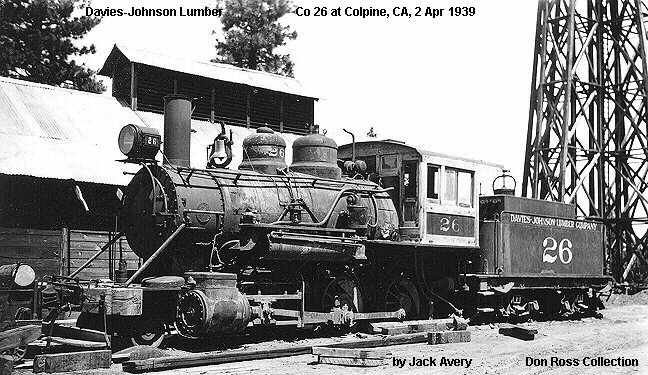 Lumber that was not kiln-dried or stacked in the large yard at White Pines (mostly between the mill and the logging camp south of the mill) was taken to a lumberyard in Toyon, four miles west of San Andreas, California. There were two reasons for using Toyon for drying the lumber. First, it was desirable to have a railroad connection for shipping the lumber when it was fully dried — the Southern Pacific ran eastward to Toyon on its way to a connection with the Calaveras Cement Plant outside San Andreas. Second, it was more efficient to dry lumber in a location more sheltered than White Pines, which was in a small valley at a higher elevation than Toyon. During World War Two lumber was in great demand. Lumber from the Blagen Mill (and Toyon) was sent to many places throughout the Pacific, as well as all over the United States. 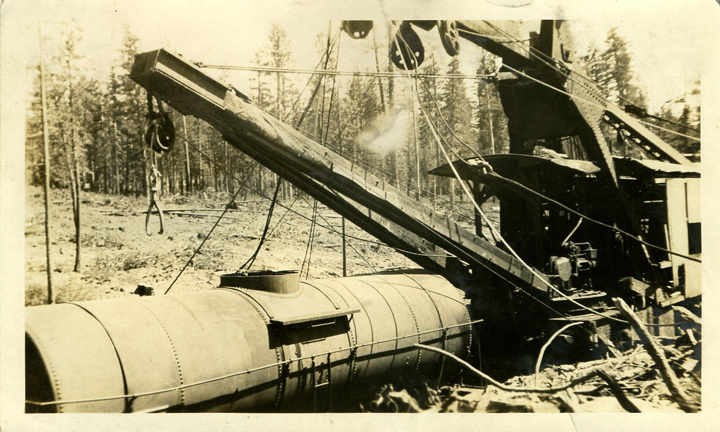 The photo labeled “Railroad crane at Davis Johnson” is in fact the Willamette skidder “Titanic” built for and used at Weed. In 1921, shortly after Long-Bell bought the Weed Lumber Company, they had this machine built. It was transfered to Ryderwood, Washington in 1927 and scrapped there in 1952. When you say “one of these saws”, I am not sure what you are talking about, but maybe you are talking about a Mercury Disston. We don’t have any idea of who might be interested in buying one, although there are collectors that might respond to a listing on e-Bay. We get a lot of our information from a chainsaw collectors group, interstingly enough, in England. Hello friends and family, I did not know frank attended aa meetings, or how he departed from his life. most everything else I see here is in the family photo albums, letters , and old newspaper articles saved by my great grandma Celeste. Im 31 years old,living in southern ca, Im working all the time and have little time to enjoy life and barely make enough to get by. i think its much better to have had it all and loose it, than it is to have never had .Frank is lucky man, he lived in a much better day and age than those of us living now.